Penetrating trauma is a rising problem on both sides of the Atlantic – just tune into any of the major news channels to see the effect. Its increasing burden on US prehospital deaths from 2007 to 2014 was recently highlighted by Sakran and colleagues1. This has resulted in an increasing emphasis2 on multidisciplinary involvement amongst emergency services and even civilians in providing basic trauma care.3 Of course, the age-old debate of rapid transport of these patients to a trauma center (and by extension immediate surgical intervention) versus providing care at scene continues. Philadelphia has several things making it unique – the city where the Founding Fathers signed the Declaration of Independence, a former capital of the US, and home of the current Super Bowl Champions, the Philadelphia Eagles. For almost 30 years, it is also amongst one of only three cities in the US (Detroit and Sacramento being the others) where police have a mandate to transport penetrating trauma victims to the nearest trauma center if they arrive on scene and no ambulance is available. 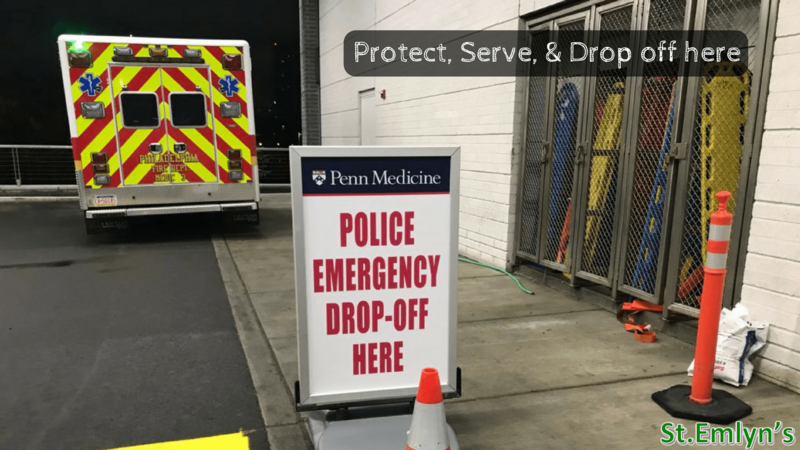 Philadelphia Police Department (PPD), often patrolling the high crime areas adjoining the city’s trauma centers, can be at the hospital in often half the time it takes to dispatch an ambulance and transport the patient. About 40% of the penetrating trauma patients at my hospital are “drop-offs” by PPD. Outwardly it seems to make sense. Police are often at the scene first, are trained to work in and can rapidly extract the victim from these volatile settings and can legally transport to the nearest trauma center at speed. Band and colleagues, initially in a single-center6and then Philadelphia city-wide7 retrospective review, found similar mortality rates for both PPD and ground EMS transports but noted there was a trend towards improved survival for the most severely injured group. Wandling’s group also more recently compared8 the two on a national trauma-system level – a retrospective analysis showed at least similar mortalities for all groups, but only 2.8% of their study group were police transports, and only 3 of the 100 most populous cities in the US used police regularly. Statistical problems aside and taking the more recent civilian transport paper into account may mean that a subset of these patients actually benefit more from police transport. How can that translate to systems that have access to physician-staffed HEMS? Scene dangers, limited HEMS resources, and multiple casualties can signal a role for police transport even in these environments. Additionally, as in a city like Philadelphia where a single agency is responsible for all emergency ambulance provision, PPD transports can help augment the city’s response capability. Of course, there’s a downside, with challenges on many levels: for the police, the patient, the hospital, and the trauma system as a whole. PPD officers with good intent will grab the injured patient and bundle them into the back of their car. Usually, there will be a single cop whose task is then rapid transport, and not patient care. These officers may not have received training in even simple hemorrhage control techniques (though this is evolving), and hence as opposed to EMS transport, the patient receives little or no medical attention en-route to the hospital. The application of a tourniquet or packing of a wound may be life-saving. Officers, not having the benefit of personal protective equipment, run the risk of exposing themselves to blood. High transport speeds carry risks of injuries to officers, the unrestrained patient, and the public if the officer gets into an accident. Hospital personnel often receive little to no warning of the arrival of these critically injured patients. It’s not unusual for my busy ED shift to be punctuated, without warning, by the sounds of screeching tires in the ambulance bay. We quickly drop everything and run to the trauma bay as the clerk shouts “police drop-off!” The trauma team may not have time to prepare and performance may break down due to the highly dynamic nature of the resuscitation and lack of immediate availability of senior clinicians. More importantly, significant trauma systems issues can develop. Though augmenting the ambulance service, this practice can foster resentment amongst EMS colleagues who may see their domain being encroached upon. There may less incentive to better fund the EMS service as a whole. There is sometimes poor communication and collaboration as the two services fall under different command structures. Finally, this long-standing practice for penetrating trauma may expand to transport of blunt trauma without clear medical direction. This gradual mission expansion can have significant consequences, as occurred on May 12, 2015. That morning, a New-York bound Amtrak passenger train derailed near one of the northeastern neighborhoods of Philadelphia, resulting in 8 deaths and over 100 injured. Many victims of the accident tried to leave the site immediately. As PPD officers encountered these primarily bluntly injured people, they placed them in their cars and transported them to the hospital without EMS triage at scene. As a result, of the 186 victims taken to hospital, only 24 went by EMS. Only 3 of the 43 most critically injured were EMS transports. 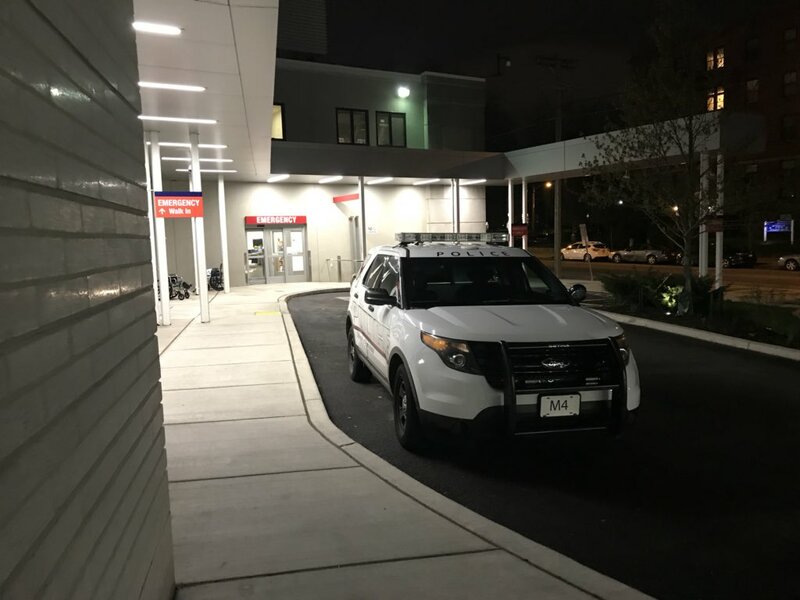 PPD transported primarily to one area level 1 trauma center, overwhelming their resources despite four other level 1 trauma centers being at a similar distance and ready to receive patients. One critically injured patient was taken by PPD to a non-trauma hospital and required secondary transfer. None of these patients received any medical evaluation or care en-route, and crash-site Fire Department command had difficulty tracking where these patients went. The resulting National Transportation Safety Board report9 cited distinct lack of integration of PPD and Fire/EMS major incident transport policies as a significant contributor to uncoordinated medical transports. Police transport appears at least non-inferior if not marginally better for a subgroup of severely injured penetrating trauma victims, at the cost of lack of provision of medical care during transport. It can prove a more reliable solution than private transport, can be timelier when there are delays for EMS due to scene safety issues, and at times can augment capability when EMS/HEMS resources are limited. Defining which group will benefit the most needs to be the subject of future study. Successful integration requires mission alignment across agencies, clear protocols, and community support. In a world where the number of penetrating trauma victims is rising – we should continue to explore all avenues of improving care for these patients. The Hartford Consensus. American College of Surgeons. https://www.facs.org/about-acs/hartford-consensus. Published 2018. Accessed April 26, 2018. BleedingControl.org . Bleeding Control. https://www.bleedingcontrol.org. Published 2018. Accessed April 26, 2018. Hospital Cases. Philadelphia Police Department. http://www.phillypolice.com/assets/directives/D3.14-HospitalCases.pdf. Published 2017. Accessed April 26, 2018. Derailment of Amtrak Passenger Train 188 Philadelphia, Pennsylvania Ma y 12, 2015 . NTSB. https://www.ntsb.gov/investigations/AccidentReports/Reports/RAR1602.pdf. Published 2016. Accessed April 26, 2018. Next: Next post: The Resuscitationist’s Guide to Health and Wellbeing. A St Emlyn’s e-book.